Daisy and Dee is an anecdotal memoir about a woman and her unusual pet. 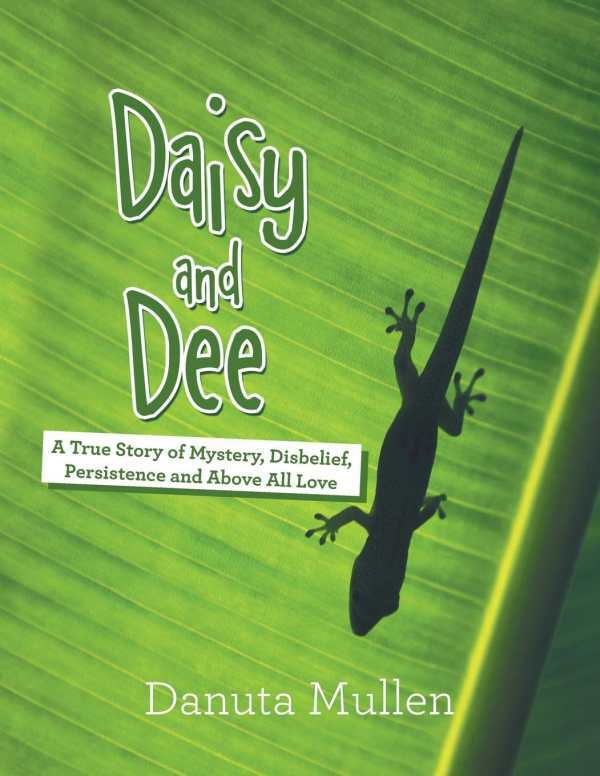 Danuta Mullen’s brief but heartwarming memoir Daisy and Dee is about finding an unexpected friend in need of rescue and of devotion across species. One summer, Mullen spots what she thinks is a toy lizard in her garage. It disappears, then reappears, and she assumes that the neighbor children are planting it there as a joke. But in the fall, Mullen realizes that the toy—resembling a baby crocodile—is actually a living creature. Thinking it won’t survive the winter, she rescues it and struggles to figure out how to care for it. Eventually she comes to love this new animal friend, whom she calls Daisy. The essay-length story highlights the needs of Mullen’s unusual house pet and the rapport that she develops with it. Mullen gleans information about how to cater to Daisy’s peculiar needs from a pet store and returns home with a terrarium, rocks, lights, and a cave. She buys crickets and worms to feed Daisy. Some scenes are amusing—as when Mullen tries to feed Daisy crickets—but the book is action-light. The book is also light on critical details, preferring summaries of events over active scenes. While it includes a cursory description of Daisy’s appearance, it is unclear how Mullen determines what species she is; it isn’t until late in the story that Daisy is clearly identified as a Leopard Gecko. The narration expresses delight at how much Daisy interacts and communicates with Mullen, particularly when it comes to her preferences and needs, but doesn’t share the particulars of those communications. Daisy is said to seek help shedding her skin every two weeks, and is said to like baths, but it is unclear how the gecko expresses either feeling. Some declarations, such as that Daisy would “pin [Mullen] down” if her habitat weren’t cleaned right after she dirtied it, are too exaggerated, and clichés detract from the story. Daisy and Dee is not direct about its target audience or purpose. Its afterword reads more like an introduction, and an author’s note feels out of place at the end of the story. Daisy’s thick leopard-print tail, which stands in marked contrast to the bright yellow skin on the rest of her body, comes as a surprise in the low resolution photographs that are featured at the end of the book. Several friends who play a minor role in the story also appear among those thirteen pages, but the images are out of focus and taken at too great a distance, while the story itself is told over the repeated backdrop image of a daisy. Such additions come to feel like distractions.